Are Anonymous special-interest combatants? The SIG (special interest group) is a well-worn concept in hacker culture. What happens when a SIG is willing to attack organization to promote the subject they hold most dear? They become 21st century soldiers who open up a third front in a war without the backing of a government. The changing dynamics are fascinating so long as you can set aside the horror associated with thinking about how the other two sides are killing people. Let’s not make the mistake some would encourage us to make: don’t anthropomorphize Anonymous. We know there is no collective consciousness. Not for a religion. Not for a nation. Not for for an army. There only individuals cooperating. The particular Anonymous philosophy makes it even harder to think of the group as a person. Maybe it will help people see governments as (merely) people too. When the people in Anonymous cooperate for a cause, we can’t ignore a significant difference in motivations. People in a government cooperate to preserve a system of slavery. (How free range the slaves are is not significant.) 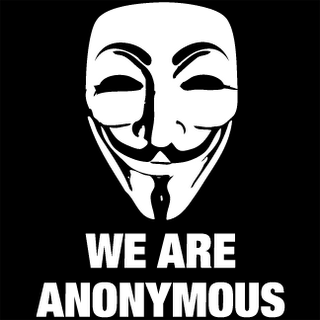 The people in Anonymous seem to be cooperating to preserve an idea: the Internet and its implied freedom. This will continue to be difficult for governments to address because while governments have relied on indoctrination, presumably everyone in Anonymous joined by choice. But when the government of Israel publicly threatened to sever all Internet and other telecommunications into and out of Gaza they crossed a line in the sand. As the former dictator of Egypt Mubarack learned the hard way – we are ANONYMOUS and NO ONE shuts down the Internet on our watch.